How to create Excel xlsx files from a script? I highly recommend John McNamara's modules. He uploaded a new Python module called XlsxWriter for creating XLSX files to PyPi that I packaged for Debian and Ubuntu. It is a port of a Perl module that he wrote called Excel::Writer::XLSX which is a extension of another Perl module called Spreadsheet::WriteExcel. It can be used to write text, numbers, and formulas to multiple worksheets and it supports features such as formatting, images, charts, page setup, autofilters, conditional formatting and many others. It supports more Excel features than any of the alternative modules. It is fast and can be configured to use very little memory even for very large output files. Integration with Pandas (Python Data Analysis Library). # Widen the first column to make the text clearer. # Add a bold format to use to highlight cells. # Write some simple text. # Write some numbers, with row/column notation. Visit this page for a full list of XlsxWriter examples. The Excel::Writer::XLSX module can be used to create an Excel file in the 2007+ XLSX format. Multiple worksheets can be added to a workbook and formatting can be applied to cells. Text, numbers, and formulas can be written to the cells. Excel::Writer::XLSX uses the same interface as the Spreadsheet::WriteExcel module which produces an Excel file in binary XLS format. 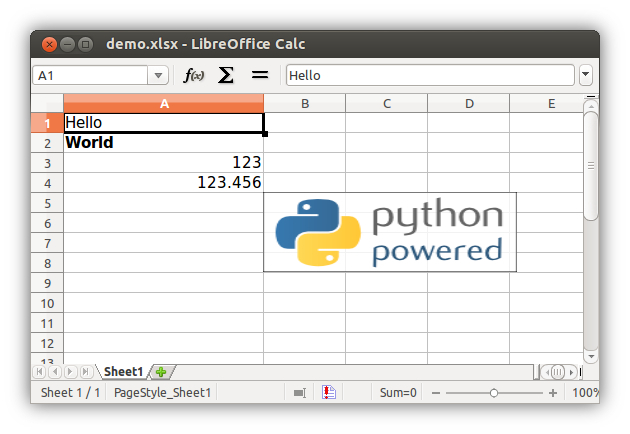 Excel::Writer::XLSX supports all of the features of Spreadsheet::WriteExcel and in some cases has more functionality. For more details see Compatibility with Spreadsheet::WriteExcel. The main advantage of the XLSX format over the XLS format is that it allows a larger number of rows and columns in a worksheet. The XLSX file format also produces much smaller files than the XLS file format. # Write a formatted and unformatted string, row and column notation. Visit this page for a full list of Excel::Writer::XLSX examples. Not the answer you're looking for? Browse other questions tagged python scripts python3 perl xls or ask your own question. How do you convert many files from .xlsx to .xls? How to create a virtualenv with Python3.3 in Ubuntu? Why doesn't python run from a 'script' file?